The training and tribulations of a Budding MTB'r (and dad): MTB'r or Roadie? MTB'r! Its funny when you start to take mountain biking seriously, you spend more of your time on a road bike. Then you start to like the roadie side of things too. 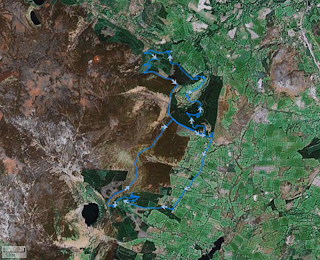 But after yesterdays spin around Crone, Maulin, Ballinastoe and Djouce - I know I'm a mountain Biker through and through. The 5 of us started at Crone car park at 10am. The plan was for a long spin with lots of tough climbs and fun descents. So we decided to get the toughest climb out of the way first - Maulin. The route up is a disused fire road that has been converted into a walking trail - complete with drains which cut the trail itself, so on top of having to deal with the climb you also have these gulleys which require some manhandling of the bike. When we got to the top we have travelled 3.5 kms and climbed just shy of 500 meters. So a quick breather and then the descent down to the river crossing above Powerscourt water fall. This was another challenging route, which at times was hike a bike, but there were still some fun bits. Then we climbed back up on the wicklow way and down ACK - the most rooty trail I've every been on. We then took the road to Ballinastoe and availed of the biker stall to get some refreshments and a sit down. Once back in the saddle we used some of the trails to climb up to the wicklow way again and onto the boardwalk which is made of two railway sleepers laid side by side for about 3 kms over the mountains. I did this route the opposite way last year and it was hairy keeping a bike on a 2 foot trail raised off the ground. But this time we were riding up it! But it was quite straight forward and challenging when you were climbing and there was a step you had make. When the sleepers ended it was single track around the side of Djouce Mountain and back to ACK. That was the best section of the route. Fast single track and a super grassy descent to finish it off. Its on video so I hope to get it up here early next week. Then its was down ACK again, and into a 'secret' trail - its an old forgotten route down to the Earl's Drive which, with a little bit of work, will be an awesome piece of singletrack. Then it was down to the shop for another refuel before the climb back around the base of Maulin to the cars. It ended up being a 5 hour spin and 30 kms, of which 25 were off road. So all in all one of the best days on a Mountain Bike I've ever had!